Crocodile attacks on humans are common in places where large crocodilians are native and human populations live. Less than half of the 25 crocodilian species have been involved in fatal attacks on humans, and only crocodilians about 2.5 metres (8.2 ft) in length or more represent a serious danger to humans, as smaller crocodilians are considered incapable of killing adults. However, even the smallest species can inflict painful bites requiring stitches. In addition, a small child may be of a similar size to the prey of some of the crocodilian species incapable of preying on adult humans. It has been estimated that about 1,000 people are killed by crocodilians each year. 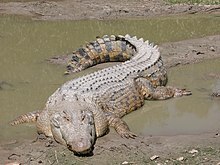 The two species with the most well-known and documented reputation for preying on humans are the Nile crocodile and saltwater crocodile, and these are the perpetrators of the vast majority of both fatal and non-fatal crocodilian attacks. Each year, hundreds of deadly attacks are attributed to the Nile crocodile in Sub-Saharan Africa. In Southeast Asia, Australia, New Guinea, and the Solomon Islands attacks by saltwater crocodiles often occur. Reviews indicate that at least half of all attacks by the Nile and saltwater crocodiles are fatal (in Australia, however, only about 25% of saltwater crocodile attacks are fatal). The mugger crocodile is also very dangerous to humans, killing several people in India every year and with a fatality rate (slightly less than half of all attacks are fatal) that is almost as high. Unlike the predatory attacks by Nile and saltwater crocodiles, victims of mugger crocodiles are often not eaten, indicating that many attacks by this species are territorial or defensive rather than predatory. Crocodilians will defend not only themselves, but also their nest and young from anything they perceive as a threat. Eight other species have been involved in fatal attacks on humans, but in far lower numbers than the Nile, saltwater and mugger crocodiles, and also with significantly lower fatality rates (a higher percentage of their attacks are non-fatal). These are the West African crocodile (often considered quite harmless, but has been involved in several attacks, also fatal), American crocodile (only a few documented fatalities), the Morelet's crocodile (typically considered a relatively non-threatening species, but there have been several fatal attacks), Orinoco crocodile (fatalities recorded in the 1930s and earlier when the species was more common, but today it is very rare), Cuban crocodile (generally considered aggressive, but only one confirmed fatality), black caiman (fatal attacks confirmed in Brazil, but possibly underreported because of its remote range), American alligator (an estimated 6% of attacks are fatal), and false gharial (only a few confirmed fatalities, all involving very large false gharials). In addition to these, the freshwater crocodile, Philippine crocodile, Siamese crocodile, broad-snouted caiman, spectacled caiman, yacare caiman and gharial have been involved in non-fatal attacks. Four of them, the Siamese crocodile, broad-snouted caiman, spectacled caiman and yacare caiman, each are suspected to have been the perpetrator of a single fatal attack on a child (smaller and therefore a more likely target than an adult), but the exact species identity in these cases is not entirely certain. An accurate count of annual crocodile attacks on humans is difficult to obtain. Many of the areas in which humans and large crocodiles come into contact are remote, impoverished, or in areas of political unrest. Crocodile attacks are not always reported to local authorities, and some reports are difficult to verify. Nevertheless, some information does exist: for example, it was reported by CAMPFIRE in Zimbabwe that in the first ten months of the year in 2005 crocodiles were the number one cause of death in humans where wildlife was involved – with the number of deaths cited as 13. Unlike other "man-eating" crocodiles, such as the saltwater crocodile, the Nile crocodile lives in proximity to human populations, so contact is more frequent. Although most attacks are not reported, the Nile crocodile is estimated to kill hundreds (possibly thousands) of people each year, which is more than all other crocodilian species combined. One study posited the number of attacks by Nile crocodiles per year as 275 to 745, of which 63% are fatal, as opposed to an estimated 30 attacks per year by saltwater crocodiles, of which 50% are fatal. In both species, the mean size of crocodiles involved in nonfatal attacks was about 3 m (9.8 ft) as opposed to a reported range of 2.5–5 m (8.2–16 ft) or larger for crocodiles responsible for fatal attacks. Since a majority of fatal attacks are believed to be predatory in nature, the Nile crocodile can be considered the most prolific predator of humans among wild animals. The most deaths in a single crocodile attack incident may have occurred during the Battle of Ramree Island, on February 19, 1945, in what is now Myanmar. Nine hundred soldiers of an Imperial Japanese Army unit, in an attempt to retreat from the Royal Navy and rejoin a larger battalion of the Japanese infantry, crossed through ten miles of mangrove swamps that contained saltwater crocodiles. Twenty Japanese soldiers were captured alive by the British, and almost five hundred are known to have escaped Ramree. Many of the remainder may have been eaten by the crocodiles, although since this incident took place during an active military conflict, it is impossible to know how many deaths can be directly attributed to the crocodiles instead of combat-related causes. It is estimated that each year hundreds of people die from crocodile attacks in Africa – many of these attacks are never reported in the media. Without an accurate reporting system in place, crocodile attacks in Africa are difficult to track and very few are reproduced here. The majority of attacks recorded below have occurred in Southeast Asia and Australia. On May 22, 1992, an Iban girl, Dayang anak Bayang was killed by Bujang Senang at Pelaban River, another tributary of the great Batang Lupar River near Lingga in Sri Aman Division, Sarawak, Malaysia. The crocodile was shot to death by several police sharpshooters and Iban hunters. It was the biggest and oldest crocodile ever caught in the area. In January 2001, attacks by mugger crocodiles were reported on tribal population around the Neyyar reservoir in Kerala, India. Muggers are raised and periodically released into the reservoir from the Neyyar crocodile centre. This rare display of aggression was found to be the isolated behaviour of an abnormal minority among the Neyyar muggers which are usually not known to attack humans. In October 2002, 23-year-old German student Isabel von Jordan was killed by a saltwater crocodile in Kakadu National Park, Australia while swimming in Sandy Billabong with her sister Valerie and a few other foreign backpackers. Estimated to be around 20 feet (6.1 m) in length, and to weigh more than 2,000 pounds (907 kg) Gustave has been credited with killing hundreds of people at the Rusizi River in Burundi. Numerous capture attempts have been made, including using a massive bear trap in 2002; however, Gustave has evaded capture. Gustave is the basis of the film Primeval (originally titled "Gustave"), which follows a news team sent to Burundi to capture Gustave; while doing so they become a target of a warlord in the midst of an African civil war. In September 2005, Russell Harris, a 37-year-old British engineer, was killed by a large saltwater crocodile while snorkeling off Picnic Beach in Australia. His body was recovered. On March 19, 2006, University of Washington medical professor Richard Root, age 68, who had moved to alleviate a shortage of physicians, was killed on a wildlife tour of the Limpopo River when a crocodile emerged from the river, and pulled him underwater. In April 2007, a 9-year-old Chinese child was killed in a crocodile pool at the Silver Beach holiday resort in southwest Guangxi region. On February 8, 2009, 5-year-old Jeremy Doble was attacked by a crocodile in far north Queensland Daintree River, Australia. Police confirmed that human remains found in a saltwater crocodile caught nearby were those of the boy. In April 2010, a 25-year-old woman from New Jersey was killed by a saltwater crocodile while snorkeling in India's Andaman Islands. Havelock Island, where the attack took place, lies 45 miles from the Lohabarrack Salt Water Crocodile Sanctuary. Her boyfriend caught the attack on film; the camera was recovered two days later along with her remains. On December 7, 2010, South African outdoorsman Hendrik Coetzee was killed after being attacked by a crocodile. Coetzee was leading a kayaking expedition through Congo's Lukuga River at the time of the attack. On September 4, 2011, A 20.2-foot (6.17-metre) saltwater crocodile, believed to be the largest ever captured, was trapped in the southern Philippines after a spate of fatal attacks. The crocodile is suspected of eating a farmer who went missing in July in the town of Bunawan, and of killing a 12-year-old girl whose head was bitten off two years before. On May 29, 2016, 46-year-old Cindy Waldron and her childhood friend, Leann Mitchell, 47, went for a late night swim at Thornton Beach in Daintree National Park, to celebrate the end of Mitchell's cancer treatment. Waldron was snatched by a crocodile and called for help. Mitchell tried to save but was unsuccessful. What were believed to be Waldron's remains were found inside a 14-foot crocodile on 3 June 2016. On September 14, 2017, 24-year-old Financial Times journalist Paul McClean was reported killed by a crocodile near Arugam Bay in Sri Lanka. 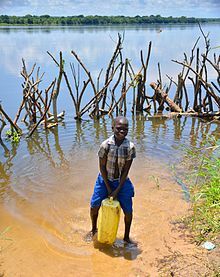 McClean stopped by a lagoon known as Crocodile Rock to wash his hands when a crocodile bit him and dragged him into the water. The lagoon is known for its large population of crocodiles. In July 2018, a man was reportedly killed by a saltwater crocodile in a breeding farm in West Papua, Indonesia. Locals slaughtered 292 crocodiles in revenge. On January 11, 2019, scientist Deasy Tuwo was eaten alive by a crocodile after falling into an enclosure at a research facility in North Sulawesi, Indonesia. Local police say the crocodile leaped up against the wall of the enclosure during feeding time and grabbed Tuwo, pulling her into the pool and eating parts of her body. Australian philosopher Val Plumwood survived a prolonged saltwater crocodile attack during a solo canoe excursion in Kakadu National Park in 1985. Plumwood recounted the details of the attack and her escape in her 1996 essay "Being Prey". Following the attack, she spent a month in intensive care in a Darwin hospital and required extensive skin grafts. ^ a b c d e f CrocBITE, Worldwide Crocodilian Attack Database: About human-crocodile conflict. Charles Darwin University, Northern Territory, Australia. ^ a b c d "Crocodilian Attacks". IUCN Crocodile Specialist Group (iucncsg.org). Retrieved 3 February 2013. ^ a b c d e f Sideleau, B., and Britton A.R.C. (2012). A preliminary analysis of worldwide crocodilian attacks. pp. 111–114. In: Crocodiles. Proceedings of the 21st Working Meeting of the Crocodile Specialist Group, Manila, Philippines. IUCN. Gland, Switzerland, Manila, Philippines. ^ Pooley, S. (2016). A Cultural Herpetology of Nile Crocodiles in Africa. Conservation & Society. 14 (4): 391–405. ^ CrocBITE, Worldwide Crocodilian Attack Database: West African crocodile. Charles Darwin University, Northern Territory, Australia. ^ a b Sideleau, B. (2015). Recent reports of fatal attacks on humans by crocodiles in Mexico. Crocodile Specialist Group Newsletter 34(2): 21-22. ^ Sideleau, B. (2014). Details of a fatal attack on a human by a Moreletʼs crocodile (Crocodylus moreletii) in Belize. Crocodile Specialist Group Newsletter 33(2): 29-30. ^ CrocBITE, Worldwide Crocodilian Attack Database: Orinoco crocodile, 15 June 1922. Charles Darwin University, Northern Territory, Australia. ^ CrocBITE, Worldwide Crocodilian Attack Database: Orinoco crocodile, 1 June 1933. Charles Darwin University, Northern Territory, Australia. ^ CrocBITE, Worldwide Crocodilian Attack Database: Cuban crocodile, 2 June 1995. Charles Darwin University, Northern Territory, Australia. ^ Rachmawan, D., and Brend, S. (2009). Human-Tomistoma interactions in central Kalimantan, Indonesian Borneo. Crocodile Specialist Group Newsletter 28(1): 9–11. ^ CrocBITE, Worldwide Crocodilian Attack Database: Data. Charles Darwin University, Northern Territory, Australia. ^ CrocBITE, Worldwide Crocodilian Attack Database: Siamese crocodile, 1 January 1928. Charles Darwin University, Northern Territory, Australia. ^ CrocBITE, Worldwide Crocodilian Attack Database: Broad-snouted caiman, 20 January 1886. Charles Darwin University, Northern Territory, Australia. ^ CrocBITE, Worldwide Crocodilian Attack Database: Spectacled caiman, 18 January 2015. Charles Darwin University, Northern Territory, Australia. ^ CrocBITE, Worldwide Crocodilian Attack Database: Yacare caiman, 3 October 2017. Charles Darwin University, Northern Territory, Australia. ^ Caldicott, David G.E. ; Croser, David; Manolis, Charlie; Webb, Grahame; Britton, Adam (1 September 2005). "Crocodile Attack in Australia: An Analysis of Its Incidence and Review of the Pathology and Management of Crocodilian Attacks in General". Wilderness & Environmental Medicine. 16 (3): 143–159. doi:10.1580/1080-6032(2005)16[143:CAIAAA]2.0.CO;2. PMID 16209470. Retrieved 3 February 2013. ^ "Jual Batik Modern Murah - Pesona Batik Indonesia (0231) 8820445". Archived from the original on 2009-02-09. ^ "People trap crocodile at Neyyar". hinduonnet.com. 2001-05-26. Retrieved 2011-06-02. ^ Anand, G. (2001-01-04). "Killer crocodile abnormal". Chennai, India: hindu.com. Retrieved 2011-06-02. ^ Wendy Lewis (2007). See Australia and Die. New Holland. ISBN 978-1-74110-583-4. ^ a b c Recent crocodile deaths in Australia. Smh.com.au (2009-04-11). Retrieved on 2011-03-19. ^ McRae, Michael. "Gustave, the Killer Crocodile". National Geographic. National Geographic Adventure. Retrieved 23 March 2013. ^ Snorkel Brit Is Killed By Croc. mirror.co.uk (2005-09-27). Retrieved on 2011-03-19. ^ Croc kills kid at holiday park: News24: World: News. News24 (2007-04-22). Retrieved on 2011-03-19. ^ Boy's body found in crocodile BBC News, 18 February 2009. ^ Lauren Failla DEAD: Vanderbilt Alum Killed By Crocodile 4 Years After Sister Dies In Climbing Accident. Huffingtonpost.com. Retrieved on 2011-03-19. ^ "River guide believed killed by crocodile in Congo". CNN. December 9, 2010. Retrieved 8 December 2010. ^ ""Lolong" holds world record as largest croc in the world". Protected Areas and Wildlife Bureau. 17 November 2011. Archived from the original on 19 April 2012. Retrieved 23 June 2012. ^ Britton, Adam (12 November 2011). "Accurate length measurement for Lolong". Croc Blog. Retrieved 23 June 2012. ^ "NatGeo team confirms Lolong the croc is world's longest". GMA News Online. 9 November 2011. Retrieved 23 June 2012. ^ "Philippine town claims world's largest crocodile title". The Telegraph. 9 November 2011. Retrieved 23 June 2012. ^ "'Lolong' claims world's largest croc title". ABS-CBNnews.com. Agence France-Presse. 9 November 2011. Retrieved 23 June 2012. ^ "Crocodile responsible for killing Cindy Waldron is shot dead". ^ "Woman watches friend dragged off beach by crocodile at night". ^ "FT journalist presumed dead after being 'dragged into water by crocodile'". The Guardian. ^ "Briton killed by crocodile while washing hands in lagoon identified as FT journalist". The Express. ^ "A Scientist Has Been Eaten Alive By A Crocodile". IFL Science. 2019-01-14. Retrieved 2019-01-14. ^ "National Museum of Australia - Val Plumwood canoe". ^ Val Plumwood. "Surviving a Crocodile Attack". The Ultimate Journey. UTNE Reader. ^ Michelle Hamer (2004-12-01). "Taken by a crocodile". The Age (Interview). CrocBITE, Worldwide Crocodilian Attack Database. Charles Darwin University, Northern Territory, Australia.